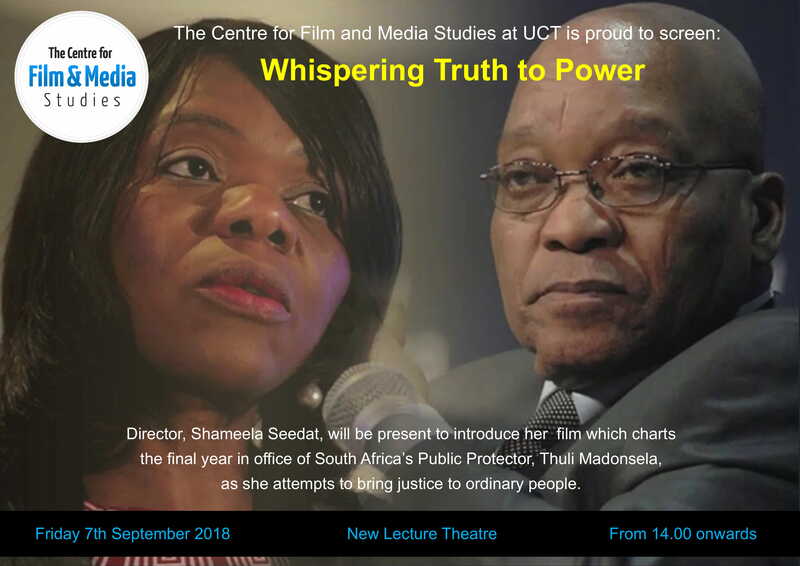 CFMS is proud to announce we will screen Whispering Truth to Power by director Shameela Seedat. Seedat will also be present to introduce the film on Friday 7 September in the New Lecture Theatre at 14:00. This film charts the final year in office of South Africa’s Public Protector, Thuli Madonsela, as she attempts to bring justice to ordinary people. After successfully challenging President Zuma for illegal use of state funds, she now has to face the biggest challenge of her career: investigating – in the face of protests, death threats and legal challenges – the alleged systematic takeover of government by a private family in cahoots with the President. But how does one weigh the importance of fighting government corruption against the larger moral crime of continued inequality? Whispering Truth to Power documents the tense story of Madonsela’s last year in public office while simultaneously crafting an absorbing tale of an outstanding lawyer, mother and woman, and also providing insight into several critical issues facing South Africa today, such as ongoing inequality, racial tensions, land redistribution, and corruption. The event is open to the public, all are welcome to join. Please note that Whispering Truth to Power will also screen at the "BRICS Media Systems in a Digital Age" symposium, which takes place on 6 and 7 September. The programme of the symposium can be viewed here.